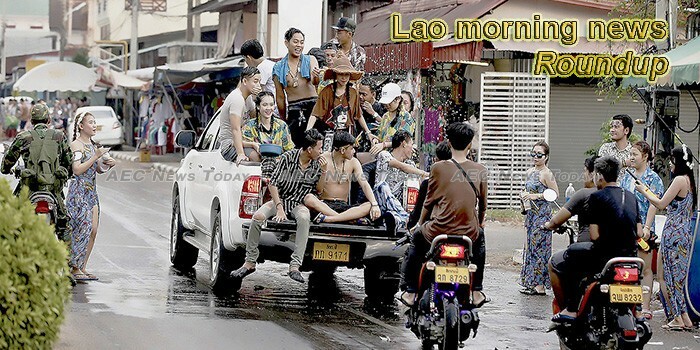 Laos and Thailand have committed to increasing bilateral trade volume by 10 to 15 per cent annually as the two governments expect to meet the target of $12 billion in 2021, according to the Lao trade minister. During the week of March 4-8, 2019, fifty young entrepreneurs from ASEAN countries and Timor Leste met in Luang Prabang Province, Laos to join a workshop on ecotourism organized through the Young Southeast Asian Leaders Initiative (YSEALI), a U.S. government-funded program. The government has obtained 2,221 tonnes of rice worth over 16 billion kip from the Asean plus Three Emergency Rice Reserve (APTERR+3) for distribution to flood victims in Attapeu province. The Australian Commission for International Agricultural Research and the Australian Centre for International Agricultural Research (ACIAR) Policy Advisory Council (PAC) arrived in Laos this week to visit ACIAR projects in the field. Mechanical investigations have followed after a brake system warning led to a Lao Airlines flight from the capital to China’s city of Shanghai returning to Vientiane’s Wattay International Airport Sunday. Ceresa Thai Perfumes, a main sponsor of Miss Laos Contest 2019, on Mar 10 opened its country branch at ITECC Mall, Vientiane on the sidelines of Top Thai Brands 2019. Xekong provincial authorities are making additions and improvements to visitor attractions so they are easier to access and provide a more enjoyable tourist experience. An innovative project to utilise Laos’ elephant experts in service of protecting the country’s natural treasures is waiting on just one thing – government approval.